'S e feallsanach aosmhor ainmeil Sìonach a bha ann an Lao Zi (Sìonais: 老子, Pinyin: Lǎozǐ, a' ciallachadh "Seann Mhaighstir"; Beurla: Laozi, Lao-Tzu no Lao-Tze). Chan eil e cinnteach cuin a bha e beò: thathar ag ràdh gun robh sin ann an 6mh linn RC agus Lao Zi co-aimsireil ri Confucius, ach tha feadhainn a' smaointinn nach robh sin ach ann an 5mh no eadhon 4mh linn RC. Stèidhich e Sgoil Tao, tè de na feallsanachdan as cudromaiche ann an Sìona. 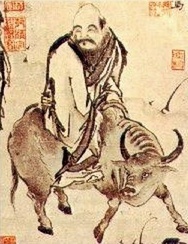 Tha e coltach gun do sgrìobh e Tao Te Ching (no Daodejing, Dao De Jing), teagsa bunaiteach na feallsanachd, leis a' bhun-bheachd wu wei - "neo-ghnìomh". Air a tharraing à "https://gd.wikipedia.org/w/index.php?title=Lao_Zi&oldid=530158"
Chaidh an duilleag seo a dheasachadh 14 dhen Chèitean 2017 aig 22:38 turas mu dheireadh.